Less than a two-hour drive from Davis, the three forks of the American River provide whitewater rafting thrills to families looking for a fun day with kids, and Class IV challenges to adventurous rafters. Families on vacation with young children can go on a Tom Sawyer Float trip down the gentle and calm waters of the Class II section of the South Fork American River after a 1.5 hour drive from Davis. The Class III section of the South Fork American is popular with first-time rafters and veterans alike because of its fun whitewater and Classic scenery—and it’s a less than two hour drive from Davis. 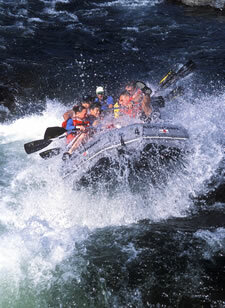 An easy drive from Davis, the Middle Fork of the American offers intermediate Class IV rapids in a remote wilderness canyon. The North Fork American is packed with challenging whitewater and stands out for its beautiful green water. This river is approx. 50 miles from Davis, California.